How long are most hunts? This depends on the species hunted, but exotics are usually 2 days and whitetail deer 3 or 4 days. (A typical hunt starts and ends on half days. 2 day hunt = afternoon, full day, morning). Are there any guide fees or daily rates? Yes, the ranch will assess a daily fee of $100 per hunter if the value of the animals harvested is less than $500. Gratuities are not included in the price of the hunt and our guides rely on gratuities. They work very hard to ensure you have a fun, safe, and successful hunt. As a general rule, the gratuity is 10% of the cost of a trophy, and 20% on doe hunts. They are a reflection of your satisfaction with our guides and are left to your discretion. Bowhunters are charged a daily fee of $250 per day regardless of animals harvested. Yes, licenses are required to hunt both native and exotic animals. Licenses can be obtained at most sporting goods stores and several locations in Bandera. I have 2 kids that want to hunt, but I only have one gun. Do I need to buy another? No, we have a youth model ported .243 that can be borrowed if needed. Due to the ported barrel, the gun recoils like a .223. Most male trophies, i.e. fallow, axis, sika, whitetail, blackbuck, corsicans, can be harvested quite easily with a 25-06 and larger. For red deer, ibex, aoudad, and gemsbok we suggest no less than a 150gr .270. Does can easily be harvested with a well-placed .243 bullet. We would much rather you bring a smaller rifle that you are comfortable with than a magnum you can’t shoot as well. I want to hunt an aoudad, but all I have is a .243? The ranch also has a 7 mag. sighted in with 160gr. partitions that a hunter can borrow for tough animals that require a bigger bullet, and more penetration to harvest cleanly. How do you hunt most of the game? 90% of our animals are harvested from box blinds, but occasionally we will use safari style or spot and stalk. We have a much higher success rate, and more clean kills via blind hunting. Do we hunt all day or just at dawn and dusk? We have done both types over the years, and have determined that dawn and dusk hunting is the way to go on this ranch. If we spend the middle of the day hunting safari style or spot and stalk, this generally disrupts the normal movement of the animals, and the evening hunt will not be nearly as good as if we let the animals rest during the day. A typical hunt is 2 to 4 hours in the morning and 2 to 4 in the evening depending on time of year and animal activity. Is the Lodge on San Julian Creek on the ranch? 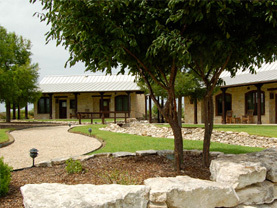 Yes, the lodge is on site, owned, and managed by the same company and staff as the ranch. All lodging will take place at this facility. Click the highlighted link or call 1.866.796.4750 for more information about accommodations.